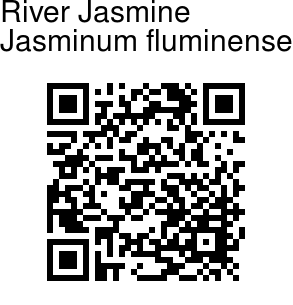 River Jasmine is a species of Jasmine to which the name Jasminum azoricum was erroneously applied. 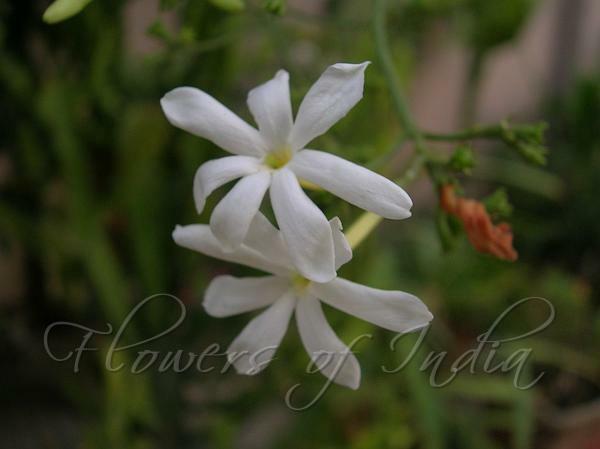 River Jasmine is an evergreen, climbing, woody vine, with young stems densely hairy and mature stems hairless. Leaves are opposite, trifoliolate, leaf and leaflets stalked; at branch-ends leaflet larger, to 7 cm long, with a stalk to 5 cm long; leaflets broadly ovate, velvet-hairy above and below, with pointed tips. Calyx is hairless, with 4-5 triangular teeth, about 1 mm long. Flowers are white, quite fragrant, opening at night, in broad, branched clusters at leaf axils; petals fused into a narrow, slightly curved tube to 2.5 cm long, with 5-7 petals shorter than the tube, spreading in star-shaped fashion. Fruit is a small, fleshy, roundish, black, 2-lobed berry.